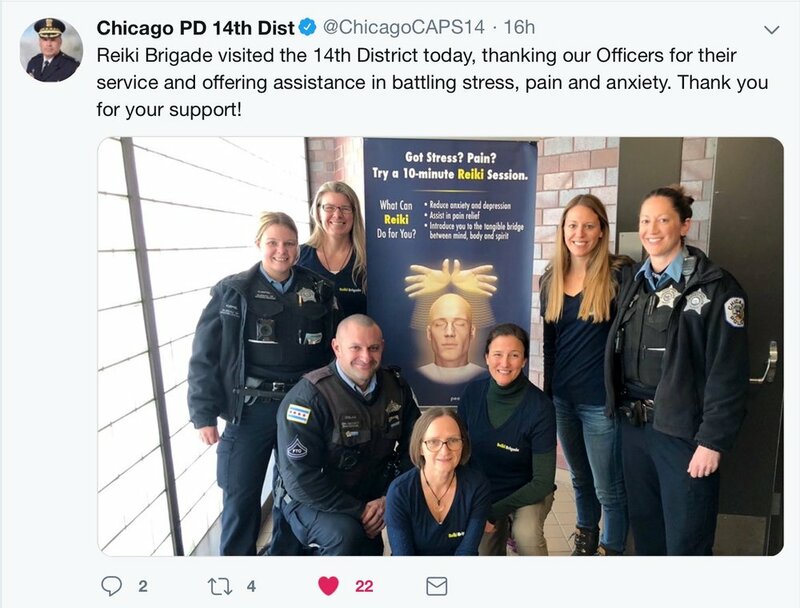 We are grateful for another amazing day offering reiki to Chicago Police officers, and the opportunity to thank them for facing dangers and challenges most of us will never have to experience. While reiki demos are always well received at the CPD, sometimes it can be challenging to get an invitation in the first place. People just don’t understand what we’re offering, or how it might benefit them. In this instance, we had a lot of help. One of our newest volunteers, Katie Sroka, has a sister working at the 14th. Tracey and Katie paved the way for us to visit, and along with officers Karen Skipper and Linda Rosales, helped promote the event before we arrived. The result was a busy day, with 26 officers and staff stopping in to try a 10-minute reiki demo before or after their shift. Some were enthusiastic, some were reluctant, all were open-minded and gracious. Another officer joked that he was hesitant to try it, and stood off to the side for several minutes watching what was going on. When he finally decided to sit down and experience reiki for himself, he was pleasantly surprised. Afterwards he asked lots of questions and said he was interested in getting reiki for his daughter, who had serious health issues as a small child and still suffered the ill effects of traumatic treatment protocols. We always hope to see a ripple effect as a result of our efforts, and helping this officer’s daughter with reiki would be an incredible win all the way around. It was a first outing for our newest volunteer recruit, Kristen. “I am so grateful to have had the opportunity to serve people that serve our community in such a profound way,” she said. “To introduce and offer Reiki is always a pleasure for me and to witness folks benefitting from and understanding the impact of this treatment is very fulfilling. I’m looking forward to our next opportunity to serve!” We are, too, Kristen! The CPD has become more active on social media as a means to connect with the community and share all their own good works. We were happy to be photographed for inclusion in their Twitter feed. Thanks to Tracey, Karen, Linda, and everyone at the 14th for the warm welcome. Thanks to Katie for her networking efforts. And thanks to veteran volunteer Edit and newbie Kristen. We’re looking forward to many more collaborations. If you’d like to learn more about reiki, you can watch our intro video. For a steady stream of good vibes, follow our FB page. And feel free to share your experiences in reiki outreach with us—we love to hear from our counterparts around the country!